Whilst the gold market continues to storm ahead, silver spot prices have most definitely stalled at this level, and the upwards momentum of spot gold, is having little impact on the industrial metal as it tries to break through this area of solid price congestion in the $16.50 to $18.50 per ounce region. 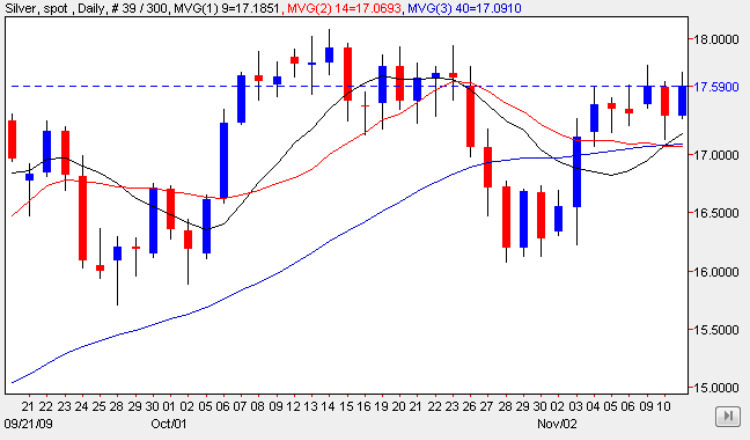 Whilst the moving averages do seem to be providing a degree of support, their ‘weight’ as technical signals at present is somewhat reduced, given the tight bunching that is now occuring due to the sideways movement of the last few weeks, and the key level still remains the $18 per ounce price level. For any sustained break higher we need to see this level breached, and a hold at the $18.50 per ounce price point to provide us with a clear signal that the potential resistance area that we are battling through at present has become potential support. Should this occur then we can assume that the upwards trend for spot silver has been re-established, but technically the chart is beginning to look weak, as the constant failures at this price level are beginning to create a bearish flavour. However, with gold still rising sharply, the precious metal may eventually provide sufficient traction to drag spot silver prices higher in due course, but the correlation is looking increasingly weak and therefore we need to be cautious in our silver trading over the next period.